carNAVi FAQ (Knowledge Base) - How can I change the keyboard layout? The default settings for this onscreen keyboard is a 'ABCDE' layout. Experienced computer users may prefer a 'QWERTY' layout, like on your computers keyboard (see below). 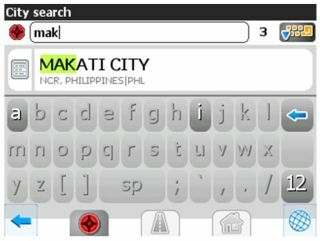 To change the onscreen keyboard layout, select MENU - SETTINGS - REGIONAL SETTINGS - KEYBOARD an select your prefered setting. At software version 3.2.x this setting is available at MENU - SETTINGS - ADVANCED - KEYBOARD. There are two pages,  for the text input and  for the search layout.